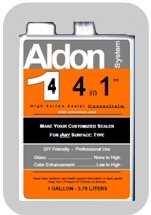 4 in 1 Sealer Concentrate by Aldon. For stone, brick, slate, marble, all surfaces. Product: "4 in 1 Sealer Concentrate"
A concentrated formula that will make SBS Sealer, Porous Stone Sealer, Penetrating Paver Sealer, and Mexiglaze - OR any solids level in between these as suits your unique surfacing needs and your appearance goals. Designed to penetrate into any surface of surface type and build to the desired level of gloss from none to high. Highly penetrating, solvent base acrylic. Used indoors and outdoors - does not yellow or break down. Does not require reapplication yearly as with other companies sealers. Requires fewer applications than other companies sealers and dries in a few hours to allow faster floor use. Clear with some enhancement of the surface's natural colors. Allows gloss reduction (if higher than desired) by using lacquer thinner or acetone to dissolve solids for further penetration into the surface (or removal with a clean, white cloth). Note: Are you sealing a small, enclosed area (bathroom, shower, etc.)? Click here for safety information. The following is true when using solvent base sealers from any manufacturer. All solvent base liquids have an odor level to some degree. Some people are sensitive to solvents or may have physical conditions that dictate inhalation should be avoided. Read our labels regarding proper ventilation recommendations that apply to all solvent sealers from all manufacturers. Regarding sealing in small, enclosed areas. Either use our water base sealers with some fresh air ventilation, or if using a solvent base sealer - follow the label recommendations about fans, cross ventilation, moving air to outdoors through windows or doorways.
. "4 in 1 Sealer" is a concentrated formula of high solids content. It is designed to be diluted so that this one product will create not only Aldon "SBS Sealer", "Penetrating Paver Sealer", "Porous Stone Sealer", and "Mexiglaze" - but also any solids levels in between to fit the needs of every surface type with just this one product.
. "4 in 1 Sealer" meets all restricted usage rules domestic and global, including in the South Coast Air Quality Management District (SCAQMD) in California. It is VOC exempt.
. 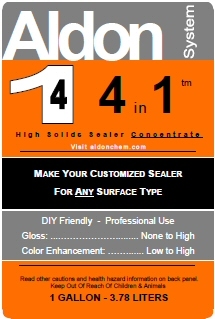 When diluted it can create up to 4 gallons of sealer, and at lower cost.
. "4 in 1 Sealer" is diluted with Acetone. Acetone is a very common, inexpensive solvent found at all big box, hardware, and paint stores. It costs much less than a sealer. Acetone, like all fast drying solvents, is a flammable material with label cautions that need to be followed.
. Any sealer is really about the solids. The solids are carried by the liquid into the surfacing and left behind when the liquids evaporate. The liquid component is designed for drying time, air quality needs, penetration ability, etc. etc. Additional applications (and/or less dilution) build to the gloss level you want. This concentrate is designed around the rapid drying benefit of Acetone and the fact that, like the 4 in 1 Sealer Concentrate, Acetone is "VOC exempt" for air quality concerns.
. Because "4 in 1 Sealer" dilutes to any sealer solids level you want, you only need this one product. You don't need to invest in 2 or more sealers to take care of very different surfaces. You customize it to the solids level you want.
. Used by DIY and professional installers. Contractors would always have a gallon or two of this concentrate on hand to rapidly start any project of any surface type using their chosen solids level.
. You are a contractor or Do It Yourselfer who realizes that choosing "4 in 1 Sealer" is the safest choice when you are not sure of the job conditions and desired results. The dilution can be adjusted on the job site to achieve the unique needs of each different surface type.
. When in doubt, a project can be started with the "SBS Sealer" dilution to accomplish the best penetration and bonding with unknown conditions. Then, the second application can be a higher solids level to achieve the desired finish. All with the one concentrate and varying dilutions.
. Storage: you only have one sealer to keep on hand for any future project, not 2 or more kinds. Less space needed, less money invested.
. You want a very tough surface. All our sealers are designed to be walked upon, therefore, they are resilient (don't crack) but are very tough.
. You want to strengthen a weak, eroding, or powdery surface.
. You want to stop efflorescence (white powder from below the surface).
. You want to make minor color differences in surfacing and/or grout blend together and even out.
. You want to be able to customize the gloss level.
. You want a sealer that is easily patched in the event of severe damage.
. You want a sealer that can be used on many more types of surfacing in the future. Traffic Wear? Any time you create gloss with a sealer, it is subject to traffic wear. You can prevent traffic wear by coating a sealer with: "Lifeguard". What about food spills, grease spots, etc.? "Insta-Clean" is a powerful grease, wax, oil remover used on any surface. On any sealer, stone, tile, wood, vinyl, machinery, engines, etc. Will soften and remove some water based type floor coatings and waxes. Streaking from wet mopping? "Maintain" is a dilutable wet mop solution that does not create streaking on any glossy surface, such as any sealer, stones, glazed and porcelain tiles, wood, vinyl tiles, etc. Frequent dust mopping? "Dust Whiz" is a spray for any dust mop. With a wide janitorial mop you can dust 1,000 square feet at an easy pace. Used on sealers, stones, glazed and porcelain tiles, wood, vinyl tile, etc. On your phone? Turn sideways for easier viewing. It is very important that you understand this concept so you do not waste time and effort in the wrong direction. Instead, think about what might be different about the job conditions that you were told or believe. We will assist in identifying what that might be and save you considerable time.
. Your conditions may have been misdiagnosed! (It can happen, even with all the information we provide.) Contact Us with the details and we will assist.
. The surface conditions (absorption rate, contaminants, temperatures, etc.) are other than thought. Click here for FAQ's and : for this product. To see tips on protecting walls and baseboards with masking, click here. All strippers, including Aldon "Premium Stripper" do not remove what is below the surface, therefore, test with water drops when finished to determine floors ability to allow sealer penetration. If the floor (including grout joints) beads water you do not need any more sealer. Just use "Lifeguard" on this still non-absorbent surface. If removing an Aldon sealer (and that should never be necessary) - see sealer product page to determine the sealer type. Also see the sealer label for any special considerations. When you read all the health and safety warnings on a label, you will see we have done our best to make you think about working with any chemicals from any manufacturer. Even household cleaners purchased in supermarkets (many with more hazardous ingredients than we use because they are less expensive for the manufacturer) should be used with common sense and awareness. People have been injured by not knowing you can create poisonous gases by mixing chlorine bleach with some cleaning products. One of the many criteria involved in Aldon products is that all our products will be used with any other of our products and no normal combination of usage events should be hazardous. Nevertheless, use common sense and don't be in a hurry. Let each step prove itself satisfactorily before proceeding to the next. Some people are allergic or sensitive to some chemicals, especially petroleum solvents. In that case, evaluate our water based products. With the solvent type products, immediately as applied use proper cross ventilation fans blowing across the floor and out the doors and windows. Do not use any chemical products from any manufacturer in a house with the sick, elderly, pets, babies, or other concerns.